Sheffield was an important Martian city, home of the two successive space elevators and a hub for interplanetary trade and political decisions. Situated in Pavonis Mons ("peacock mountain" in Latin), one of the big Tharsis volcanoes, at the planet's equator, it was the perfect candidate for being the receiving end of a space elevator. From the moment UNOMA approved the elevator, in ca.2047, to the moment it was completed, in ca.2058, Sheffield experienced a tremendous amount of development, with infrastructure to transport manpower and goods to the planet's future departure point for Terra. Sheffield offered a magnificent view inside the caldera of Pavonis Mons. UNOMA financed the construction. However, equipment and personnel had been provided by Praxis. The elevator touched down on Mars in the so-called Socket, the complex where elevator cars were loaded and unloaded. Sheffield housed the offices of the Space Elevator Authority. Sheffield became the third capital city of Mars, taking over from Burroughs. Many small tents were created around it as immigrants arrived and the Sheffield metropolis expanded. The tents were connected by a railway web. Some adjacent tents were Texas (mainly populated by Americans), El Paso (mainly populated by Americans and Latinos). During the First Martian Revolution, the elevator was destroyed; the elevator cable wrapped itself around Mars and fell across the eastern side of the metropolis' domes. The Sheffield metropolis was partially destroyed. A second space elevator was planned and Sheffield was rebuilt and further developed, building over the ruins of the first city. The second elevator opened in the end of the 21st century and Sheffield remained an important trade hub. During the Second Martian Revolution, it saw violent skirmishes between UNTA forces and the Kakaze, who were attempting to take down the elevator. It then hosted the congress set to draft a Martian constitution. The strategic nature of the elevator made Sheffield also play a role in the Third Martian Revolution, when Terran forces took over the elevator and sent down armed troops in the city. The Martian government and population were able to resolve the matter peacefully. Because of its high altitude, Sheffield is condemned to remain a tented city. Sheffield was named after the American science fiction writer Charles Sheffield, who wrote The Web Between Two Worlds featuring a space elevator. It was published in 1979, almost simultaneously with Arthur C. Clarke's The Fountains Of Paradise, which also featured a space elevator (Clarke is the name of the other end of the Martian space elevator). 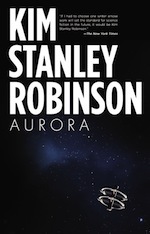 Charles Sheffield, who died in 1992, is given "special thanks" in the Acknowledgments of the novels by Kim Stanley Robinson.